Per Brohall, the Swedish designer of the very successful Viggen, received a commission in 1964 from Lars Larsson, owner of Larrson Trade AB (in 1971 renamed Albin Marin AB), to design an enlarged version of the Viggen. This would hopefully increase the sale of Albin engines. This design was intended to replace the wooden prototype of the Vega that had been launched on 29 July 1965 which, after extensive and severe sea-trials went into production. The results were so favourable that the production forms for the reinforced fibreglass hull could be taken directly from the V-1 prototype hull. The original V-1 (made from mahogany) still sails in Sweden under the appropriate name of "Mahogany". The original 5 h.p. engine was replaced by the heavier Albin 021/022 petrol engine. In 1971/1972 they changed to the well known Volvo Penta MD6A diesel engine then in 1976 a short production of MD6B (starter motors instead of the dynastart) was installed and in 1977/8 the 13 h.p. MD7A was used. In 1977/8 the design was slightly changed for some interior modifications and a wider coaming. These changes resulted in a slight larger weight and ballast increase and therefore a larger draft: 1.20m instead of 1.17m. Per Brohall also designed an enlarged version of the Vega - the Singoalla, a 34 footer. This had little success and soon its production was stopped in order to manufacture more Vegas. In 1979 the production of the Vega stopped after some 3450 were built. A lot of them were sold, of course, in the four Scandinavian countries, but also hundreds were sent to the USA, West Germany, the Netherlands, Great Britain, Switzerland, Canada, Belgium, France and Italy. They even went to Greenland, Iran, and Hawaii. In the Netherlands there are about 230 Vegas, some of them under the Belgium or German flags. The Albin company was repeatedly taken over and closed up. Little remains of the once prominent ship factory in Kristinehamn - at one time one of the biggest in the world. The Vega is constructed of glass-fibre re-inforced polyester. Her joinery work is in hardwood and veneered ply. Glass-fibre frames and stringers also serve to stiffen the hull. The mast and boom are of anodized aluminium. One lever (remote control) simultaneously alters both the engine rpm and the pitch of the propeller blades. The propeller can also be feathered for sailing. The speed of the Vega under power is a full 6.5 knots. The Vega is an "All-Weather Boat". 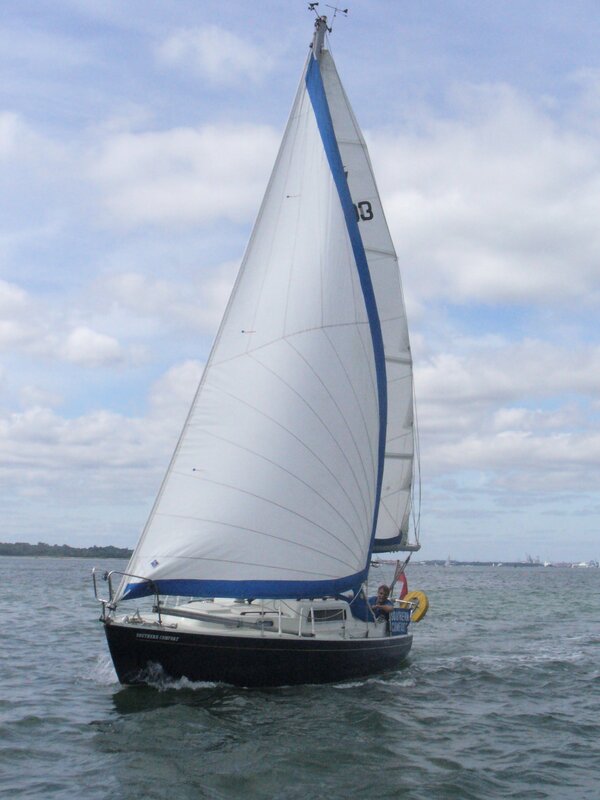 Her all round sailing qualities are excellent, and she's as responsive to the lighter breezes in coastal sailing as she is to the brisk winds found in deep water cruising. Sadly the Vega is no longer made but the moulds are still in one piece and located somewhere in Holland..... Who knows?